Fiction: Flight by Rosemary Walch | LADY. 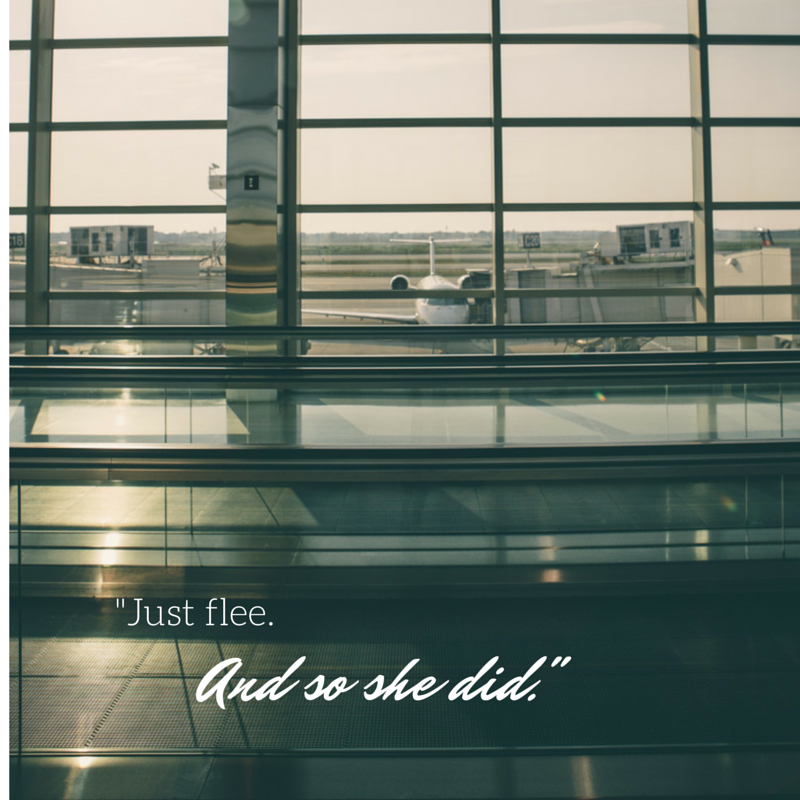 They sat in the airport waiting for her flight, not next to each other but across from each other, the short distance between them deepening the emotional chasm of their marriage. His glare bore into her like a branding iron searing the owner’s mark onto flesh. Avoiding his glare she swept a glance around the crowded terminal. Travelers were everywhere she looked. Some of the travelers were reading, some were stretching to keep their travel-weary head from bobbing, some had a glazed-eye-and-bored look. Many of them sat listening to sounds emanating from earbuds connected to hidden iPods. Some travelers moved motionless on the mechanized walkway. And everyone was feigning invisibility. No one looked her way, no one met her eyes. Did they see his glare, his anger? Could they see her aching heart? Of course not, she thought. But it felt like her heart was leaching out of her like moisture leaches out of a cold drink on a hot day. So many blank expressions on the people she observed. The idea occurred to her that perhaps they were running too. She and her husband were waiting for flights that would take them to opposite ends of the country. He was angry and frustrated, not wanting to travel, especially not to another conference. She was restless and excited, anticipation running high in her for what she hoped would be a break from the pressure of their marriage. Her trip was also work-related, but it was away, and that was the key. “Do you have anything to say before I leave?” she finally challenged. She knew she could fight the words he threw like daggers better than this glare. The glare was unnerving, his unspoken anger piercing. She was looking for an apology that would never come. He sat there, slumped in the uncomfortable airport chair, elbow on the armrest, his chin resting on his thumb, his fingers curled around his lips, his eyes avoiding her question. “Yeah. Have fun,” came the terse reply. Months ago, when the marriage began to breathe its last, she would have spewed out a list of his failings so that he could see how wrong he was to treat her with such scorn. Even as recently as last month she still worked as hard at justifying the anger that billowed inside her as she did trying to understand who he had become. But today she was just plain worn-out. Tired of trying to break through the murk of his depression and anger. Weary of walking around the corners of conversation every time they were in each other’s company. Emotionally exhausted. Gone were the days of warm love, shared dreams and desires, long talks and laughter. And she needed to accept that fact. She wanted to say so much but this was not the time, much less the place, for that conversation. Finally, a crackle, then a loud metallic voice came over the intercom to announce the flight’s imminent departure. Or so she hoped. Except instead of announcing that the flight was ready for boarding, the metallic voice said there was a delay. Delay? Oh my God, she thought. I can’t bear his hostility any longer. Why doesn’t he just leave? The heavy sighs around her almost drowned out the attendant’s dreadful confirmation of a delay that would last at least an hour. She was more than ready to leave; she needed to get away from the glare. She craved a drink so she stood up and, trailing her carry-on behind her, let the moving walkway relocate her further from her gate, further from the glare. She headed for the airport VIP lounge where she knew she would find respite from the crowd, even though she could not escape the questions drumming in her head like an ancient war chant: How do you keep your own sanity in the midst of the self-destructing depression waging war in the man you love? Or think you love? She tried to mask her loneliness, but it rang in her soul so loudly she was sure others could hear it. But no, the only sound was the silence of soft, falling tears that would not stop. The first glass of wine went down easy, as did the second. She heard the announcement that her flight was delayed, yet again. But the wine did its work, absorbing her discontent. The conversation started out innocent enough—a shared story of travel delays, a shared passion for family and the stories they evoke, a shared birth date separated by thirteen years, a shared enchantment of the beauty of southern California beaches, a shared love of spicy Mexican food, good beer and live music. More laughter over more drinks. It was innocent, except that this was happening on the heels of marriage turmoil that had culminated in the silent argument just before she left the gate. Now here she was in an airport lounge, laughing, and the sadness of the morning a distant memory—too distant for her own good. There was easiness to the give-and-take of the conversation, a gentleness that she longed for, that she missed in her marriage. “What are you thinking about?” the traveler asked. A pause settled as the woman’s and the traveler’s imaginations took flight. Not trusting herself to answer the question she thought, I’d escape. “Come on, it’s your turn. Tell me your wildest fantasy,” urged the traveler. Indulging in an innocent tête-à-tête with someone who is not your husband is okay, right? It’s not like I’m going to jump into bed with him, she rationalized. Even still, she felt a nudging in her subconscious, light at first, but steadily prodding her to leave, to flee. She took a deep breath and for a moment closed her eyes, steeling herself against the nudge. She felt like a warrior preparing for battle as she strove to push that nudge to the back of her soul. She wanted the nudging to leave her alone to enjoy this escape. This innocent escape. The newly familiar conversation quietly continued interspersed with brief touches as they discreetly moved to a booth in the far corner of the lounge. Before long, the innocence ended. The easy laughter and alcohol had melted the protective barriers, and as they lingered waiting for her flight he kissed her. The kiss was deep and long, delivered with a sense of urgency that answered her need. She broke away from the intimacy and looked aside. There it was again, the nudge—stronger now. She knew it was up to her to decide whether she would allow the kiss to wake the longing her body felt, or let the nudge open the gate to obedience to do what she knew was right. What would she choose? Her longing was intense, and real, and she craved this intimacy. She knew she needed to flee before anything else happened, before it was too late to turn back. Sometimes the right thing is the absolute hardest thing to do. Flee immorality – the Bible’s wisdom washing all over her mixed-up emotions. Flee immorality – because the aftermath of emotion is not worth the fleeting pleasure. Flee immorality – because He commands it. Just flee. And so she did. As she was leaving the VIP lounge the hostess announced that her flight, United 6225 to Los Angeles, would board in thirty minutes. When she got back to her gate the metallic voice announced that her flight was all set and they were ready to start boarding. She looked around for her husband and found that he had taken his glare and left. Relief rushed through her like a Kansas wind. His painful send-off was the final nail in the coffin of her heart and she knew that when she returned home everything would be different. She had too much life to live and too much love to share to be crushed in her soul. The traveler reminded her of that truth and she was glad for the wake-up call the traveler’s kiss sounded in her. Things were going to change, all right – of this she was confident. 2 comments on "Fiction: Flight by Rosemary Walch"
Way to go, Rosemary! I could feel her conflict all through the story. Great job! This story makes me grateful I'm over 50. It brings back vivid memories.